Happy Monday!! It is happy for me because we have Easter Monday off from school. :) So far I have read a lot, taken a nap, ridden my bike to the post office, and I'm about to have lunch! 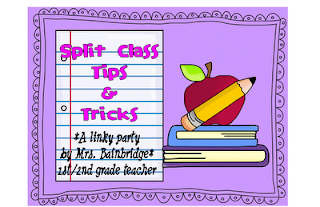 Christina Bainbridge is having a linky party about tips and tricks for managing a split class! I have gotten some emails about this as well, and I'm super pumped to read everyone else's great ideas. Just as a little bit of background - I teach a first/second grade multiage classroom in the suburbs of Chicago. I work in a Catholic school, so the multiage situation is purely out of necessity because of numbers. If you want to know more about my school, I wrote about that in my My Teeny Tiny School post. If you want to get a play-by-play of how a typical day in my classroom goes, I wrote about that in my A Day in My Shoes post. So feel free to check those out for more background info. Moving on to my tips and tricks! I teach all subjects as a whole group except for reading and math. My reading program is very scripted and doesn't allow for differentiated groups, so I meet with one grade level while the other grade does a worksheet. For math, I meet with one grade level while the other does math centers/stations. Like Christina, I encourage my first graders to work to a second grade level. The subject in which I find myself differentiating most often is writing. For example, we researched animals a while back, and I required the first graders to write a 5-sentence paragraph while I required the second graders to write an essay. But the researching and writing process was the same! I utilize peer teaching opportunities whenever possible. The second graders love to help the first graders solve math problems. I also utilize peer teaching quite a bit when we are revising and editing our writing. As our first whole group activity of the day, we complete a little Chit Chat morning message inspired by Deanna Jump. Typically, I cover what we learned the day before in science or social studies and then I'll pick the first grade or second grade math lesson from the day before to review. If I pick the first grade lesson, it's a great way to get everyone to get a little reinforcement on the skill, and if I pick the second grade lesson, it helps me see which second graders are comfortable enough with the skill to teach a first grader. It's an easy informal assessment that doesn't feel like one to the kiddos! It's important to keep in mind that I am only a first-year teacher! So every day is a new adventure, I definitely don't have all the answers, and I keep trying new things to be the best teacher I can be to my multiage classroom!! Thanks for linking up! You're so right about the firsties picking up on things from 2nd grade. I'm excited to see what everyone else posts too! When I was subbing, I often subbed at a school that had muti-aged classrooms. It is a lot of work- you go, girl! Thanks for sharing your tips - I need all I can get for next year. I'm going to check out the chit chat idea! Great ideas! I have taught 4 split classes in my years (all 4/5 splits) and I also did the whole group teaching thing, though I did it for all subjects. Luckily for me, I taught the splits before the scripting programs came into it. Thank you for sharing your tips!